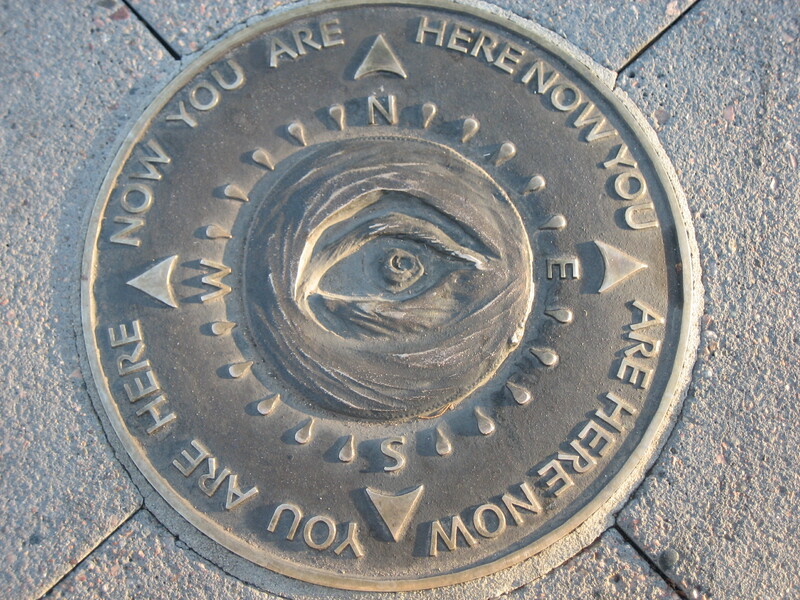 I took this photo of the sculpture embedded in the sidewalk at the the light rail station at McDowell and Central in Phoenix, AZ. As I was setting up the shot, I wondered how many people merely step over it several times a week, without thinking, Yes, I am here now. I’m here on this sidewalk. I’m here at this light rail station. I’m here in downtown Phoenix. I’m here in Arizona. I’m here in the United State of America, in North America. I’m here on this planet, in this galaxy, in this universe. I am HERE. I am here NOW. Flanked by the Burton Barr Public Library and Phoenix Art Museum, the McDowell station was a perfect match for local artist Michael Maglich. A generous man, brimming with curiosity and wit, Michael envisioned A Thousand Points of Reference as a celebration of the diverse possibilities available to the institutes’ patrons as well as the nearby neighborhoods. However, the brochure does not specifically mention the piece I am sharing today. I hope this piece gets people thinking about their place(s) in the world. Thanks for the research you did on this piece. I hope it’s ok that I linked to your blog to answer a reader question on my own blog. It is certainly ok to link to my blog. Could you share a link to your post with the link to my post so my readers can have a look? Thanks for reading. Thanks, Crystal. I’d love to read your post about the art in question. I looked at your blog, but couldn’t find that particular post. I didn’t see a search bar on your page…Cheers! Thanks for looking at my blog! Here’s the post. There is really nothing about the disc. It was one of the things that caught my attention while I was exploring the downtown one hot day.